Higher technical institutions, including the prestigious IITs and other reputed institutes of engineering and technology are facing an acute shortage of faculty, affecting both teaching and research. This is one of the reasons why the institutes seem unable to make bold strides in several newly emerging areas of science and technology. THE alleged fake encounter killing of three Kashmiris — Shahzad Ahmad Khan, Mohammad Shafi Lone and Riyaz Ahmad Lone — on April 29-30, 2010 by officers of the 4th Rajputna Rifles led by Major Upender and his team members, including two Subedar Majors and a sepoy from Rafiabad area has once again brought the spectre of extrajudicial executions in Kashmir to the fore. Indians were not adventurous like Europeans and they rarely crossed the Indian Ocean in quest for new lands. There was a time when Italian sailor Christopher Columbus sailed in search of the brave new world and discovered America. Vasco da Gama too discovered India via South African’s pictures port town, Cape Town, described as Cape of Good Hope where Pacific, Atlantic and the Indian Oceans meet. Prof Riyaz Punjabi, Vice Chancellor, Kashmir University, introduced distance education in the state during his tenure as a professor. A doctorate in law, he is an expert in distance education. Recently a team from the Union Ministry of Communication and Information Technology appreciated his work in e-governance. The policy makers in the Government of India and IITs have been concerned over the situation and are trying to find a solution to this crucial matter. Prime Minister Dr Manmohan Singh, in his address at a function held to mark National Education Day, has said that the state of affairs could not be allowed to persist and the problem of deficiency should be addressed. A credible solution needs to be evolved to meet the challenge of faculty shortage on a sustainable basis. According to an estimate, as against the sanctioned strength of 3,907 in the seven old IITs, only 2,846 positions were filled up, i.e. 1,066 (27 per cent) posts are lying vacant! The situation in sciences and humanities is quite different — there is generally no problem in getting good faculty. The shortage exists invariably in respect of technology and engineering disciplines. In fact, right from their inception, most IITs had generally been facing problems in attracting good faculty in these areas. When well known foreign universities start their campuses in India in the near future, some teachers of IITs and other reputed institutes may wish to join them. In the very recent past, there has been some improvement in the number of talented young persons applying from abroad for positions in the premier institutions such as IITs. This is in the nature of reverse brain drain, mainly due to downturn of the economy of the US and other western countries. There is another reason why bright young scientists apply to new IITs. The attraction here is of the opportunity to build up something where one is sure to leave his/her mark. However, such talented persons have also become very selective as they look for a better working environment and facilities which even very good institutes do not provide. Location of institutes has also become an important parameter for them to apply. They look for the place where their spouses can get suitable jobs and where there are good educational facilities for children. It is pertinent to identify the reasons for this acute shortage of faculty. The number of good students pursuing M. Tech and Ph. D in engineering is too small to meet the demand of technical institutions. The estimated total output of Ph. Ds in engineering in the country is around 700 annually, whereas, to meet the All India Council of Technical Education’s faculty requirements, a supply of Ph.Ds in thousands is needed, particularly in view of the mushrooming of technical institutions in the private sector in recent times. Most students passing out from reputed institutes get good jobs in private sector and very few go for M.Tech and Ph.D. There is not much of incentive for higher degrees. 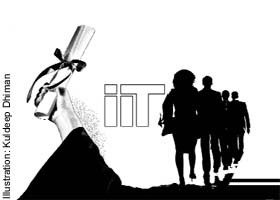 As for IITs, most of their students who wish to pursue higher education prefer to go abroad. This trend has also been catching up in several National Institutes of Technology (NITs) and other good colleges. A fairly large number of students, who do B.Tech from IITs and other good institutes, do not stay in technology and look for career options in other fields, i.e. going to a good business school for MBA or jobs, which would help them do MBA later. Good consulting and financial firms also pick up IITians at handsome pay packets in view of their high level of analytical ability as well as good commonly used technological skills. Higher education in engineering is a low priority option for a large number of good undergraduate students. The pay structure of the IITs’ faculty, though best amongst the educational institutions in the country, is too low to attract good students to pursue a career in teaching and research. Students with B. Tech degrees from IITs get starting salary packages which are often higher than their teachers, even Professors! The IITs are too selective in picking up candidates who apply for faculty positions. They want persons with Ph.D plus three years’ experience (excluding the time spent for Ph.D) of research/ teaching for the post of Assistant Professor. For senior positions such as Associate Professor or Professor, even longer teaching/ research experience is required. They do not favour candidates with only research experience even if it is in a company of international repute with excellent R & D facilities. Normally, industrial research is of classified nature, the publication of work done in industries is discouraged and the emphasis is on patents. The present system of recruitment acts as a dampener for those who wish to migrate from research to teaching institutions. A few steps have been taken to deal with the problem. The age of retirement of the faculty has been increased to 65 years in Central Government institutions. There is also an option of re-employment up to the age of 70 in IITs. This has, however, not happened in most state-run institutions. The IITs’ faculty has been given special pay package as well as a few other incentives. They have also been allowed to hire foreign faculty. These measures will, however, have a limited impact on the shortage of faculty keeping in view the huge requirement of qualified talented manpower. For instance, the increase in the retirement age and re-employment for five years (after retirement), though very good steps, also mean postponing the problem by a few years. In the meantime, a credible strategy is required to be put in place whereby IITs, especially the new ones, are able to get young and dynamic candidates on a continual basis. Though the institutes need senior faculty with experience to provide leadership and direction, a good institute is one which has younger faculty in larger proportion. The younger faculty is expected to be specially trained in the emerging areas of science and technology. The challenge, thus, is to attract young talented faculty. Worthy of consideration in this context is the practice that obtains in the Bhabha Atomic Research Centre and the Indian Space Research Organisation. We can learn from the experience of BARC and ISRO as to how they manage their R & D cadres of engineers and scientists. Normally, these organisations do not get IIT pass-outs. Instead, most of their recruits are from other institutions. Yet they have managed to develop science and engineering cadres and have kept India’s nuclear and space programmes moving. This year, about 10.5 lakh candidates appeared in the All India Engineering Entrance Examination (AIEEE) and over 4.5 lakh in the Joint Entrance Examination (JEE). The total number of seats this year in science and engineering disciplines in the IITs along with the Institute of Technology, Benaras Hindu University and the Indian School of Mines, Dhanbad, is about 9,500, which is less than one per cent of the candidates aspiring to become engineers. Thus, a large number of good students are unable to make it to the IITs because of the limited number of seats and go to the next tier of institutions. Several of such students, who could not make it to IITs, also have the potential of being groomed as good teachers and researchers. We should devise a strategy to tap this valuable human resource. For the first time in the history of education in India, higher education has come under the limelight and is in the domain of public scrutiny. There are many reasons for this — good performance of educated Indians in foreign countries, opening of economy which has created jobs including high-end ones and the economic growth. There is growing realisation among the public that without a good college / university education, one cannot get a good job and become economically better off. A Post Graduate Engineering Education Mission should be launched and various options explored to increase the turnover of M.Tech students. Good institutions, say 50 to 75, should be selected and encouraged to expand their existing Post Graduate programmes or start new ones. They should be given financial assistance with the proviso to bring about the desired structural changes required for PG education. The number of integrated B. Tech + M. Tech seats in IITs should be increased. At present, the ratio of seats for B. Tech and five years’ integrated/dual degree M.Tech in IITs is 2:1. It should be gradually raised to 1.5:1 in a time bound manner. M. Tech and Ph. D students should be encouraged to share the teaching load, i.e. tutorials or practicals. The concept of Teaching and Research Assistant on the pattern of western universities should also be explored. The required structural changes should be brought about in this regard. The intake of Ph.D scholars should be substantially increased in IITs and the Indian Institute of Science. Likewise, other institutions should be encouraged to expand their Ph. D programmes. The IITs prefer to recruit at the level of Assistant Professor. As stated above, the qualification for this position is Ph.D with three years’ research/ teaching/ professional experience and the candidate should have demonstrated research capabilities in terms of publications in reputed journals and conferences. Candidates with such qualifications are difficult to get in large numbers. Normally, good universities insist on a few publications as a part of Ph. D and this norm should suffice. The qualifications should accordingly be changed. Fifty per cent of the vacant positions of Assistant Professor in IITs etc. may be filled up as under: Select appropriate number (say 200) of candidates (holding B.Tech/ M.Tech degrees) every year in various disciplines of engineering for a period of five years through an open national level examination similar to the Civil Services Examination. The strategy should be to pick up as many good B. Techs as possible. The selection should be based on a rigorous written test in the disciplines concerned, followed by an interview. The selected candidates should be allotted institutes in accordance with merit, preference of the candidates and the availability of faculty positions. They should be sent for Ph. D to the best universities around the world, including India, with the assurance of appointment as Assistant Professor after they finish their studies satisfactorily. Agreements could be signed with the selected universities. Most of them may agree for tuition waiver as they take a large number of students for MS and Ph.D programmes and provide tuition fee waiver and/ or financial assistance. The Government of India should give scholarships to the selected candidates according to the norms of the universities concerned. Every selected candidate should be required to sign a bond of appropriate amount to serve the institute for a period of 10 years after finishing his studies. This is to guard against the eventuality that some candidates may not come back and leave the scheme mid-way or after completing Ph.D. The course work required for Ph.D could be split between IITs or IISc in India and the foreign universities with credit transfer facility. The candidates with M.Tech, if selected, should also have this facility. The programme should be integrated Ph.D and MS and not just MS. The candidates would be required to complete Ph.D within five years. A condition of publication of papers could also be inserted. Encourage candidates with experience of research in companies known for research and development work for appointment to senior positions such as Associate Professor and above. Their skills of communication and pedagogy could be tested at the time of selection. Such experts would add tremendous value to teaching as well as research in academic institutions because of their familiarity with the needs of the industry. The institutes of technology need a harmonious blend of both academics and practice. The IITs are institutes of national importance. Their students must be exposed to the prestigious science and technology projects of our country. They should be encouraged to spend summer internships in the laboratories of the Departments of Atomic Energy, Space, Bio-technology, Council of Scientific and Industrial Research (CSIR) etc. This way, the students would get a good exposure of what India is doing in science and technology. Some of them may even get motivated to work for such programmes. The total financial expenditure for the proposed scheme is likely to be about Rs 1,500 crore spread over 10 years, which is worth incurring for developing faculty for the prestigious science and technology institutes of country. After all, good science and technology is not only the principal driver of a country’s economy but also provides the crucial edge to stay ahead of other countries, more so in the age of globalisation. With so much of talent and potential for doing first-rate work, India must not lag behind the world’s most developed nations. There is an acute shortage of qualified faculty in higher technical institutes, mostly in technology and engineering disciplines. As against the sanctioned strength of 3,907 in seven old IITs, only 2,846 positions were filled, i.e. 1,066 (27 per cent) posts are vacant. Improvement in premier institutions — reverse brain drain due to downturn in the economy of the US and other western countries. The annual output of Engineering Ph.Ds in India is 700 whereas the demand is in thousands. When well known foreign universities start their campuses in India, some faculty of IIT and other reputed colleges may join them, further accentuating the problem. Increase intake for Ph.D. and dual degree/ integrated M.Tech courses in IITs. A Postgraduate Engineering Education Mission to increase the turnover of M.Tech students. lLet Ph.D, M.Tech. students share the teaching load on the pattern of foreign universities. Recruit 200 B.Tech students every year for five years by open national examination and send them to the world’s best universities for Ph.D with financial assistance and assurance of appointment as Assistant Professors. THE alleged fake encounter killing of three Kashmiris — Shahzad Ahmad Khan, Mohammad Shafi Lone and Riyaz Ahmad Lone — on April 29-30, 2010 by officers of the 4th Rajputna Rifles led by Major Upender and his team members, including two Subedar Majors and a sepoy from Rafiabad area has once again brought the spectre of extrajudicial executions in Kashmir to the fore. Defence Minister A.K. Anthony was quick to announce that the guilty will be punished. After the police inquiry indicted the army officers, the army ordered its inquiry. Mr Antony told Parliament that though his ministry received 23 requests for permission to prosecute the army in the last three years, “no permission for prosecution was granted during the same period”. Once the public anger fades away, the army authorities will make all efforts to obfuscate justice. The Jammu and Kashmir Police have been helpless in the face of the Defence Ministry’s commitment to protect the criminals in the army. The prosecution of the army officials for fake-encounter killing of Imam Showkat Ahmad Kataria of Doligam-Jabdi-Banihall is instructive. Kataria went missing on October 4, 2006 at around 10 pm from Alamgari Bazaar. The Army claimed that Abu Zahid, a foreign militant from Karachi was killed in an encounter, and buried him. However, after exhumation of the buried body of so-called Abu Zahid from Bazipora-Ajas-Bandipore on February 3, 2007, the Central Forensic Science Laboratory, Chandigarh concluded that the exhumed body was that of Showkat Ahmad Kataria and not Abu Zahid. Five army officers of the 13th Rashtriya Rifles – Col Vikram Singh, his second in command V K Sharma, Major Rishi, Junior Commissioned Officer Puran Singh and Naik Satya Lal were charged with the murder and criminal conspiracy along with five police officers and a civilian. When the Srinagar District and Session Court issued non-bailable warrants against the five accused army officers, the Army requested the court to suspend the trial pending the ruling of the Supreme Court in the case of the Central Bureau of Investigation versus Brig. Ajay Saxena. Brig. Ajay Saxena and his colleagues, Lt-Col Brijendra Pratap Singh, Major Sourabh Sharma, Major Amit Saxena and Subedar I Khan of 7th Rashtriya Rifles were charged with Pathribal fake encounter killing in which five civilians were executed on March 24, 2000. The Army claimed the five terrorists responsible for the Chhatisinghpora massacre of the Sikhs on March 20, 2000 were killed in an encounter. In April 2006, the CBI following an investigation found that the so-called five terrorists killed at Pathribal were civilians killed in fake encounters and filed charges against five army officers — before the Chief Judicial Magistrate, Srinagar. The accused army officers challenged the CBI’s chargesheet on the ground that the CBI did not have prior permission of the Central Government to chargesheet them. On June 21, 2006, the CBI replied before the court that the Central Government’s permission was not necessary in this case. The J and K High Court also dismissed the appeal of Brig. Saxena and others. The last hearing of the SLP filed by Brig. Ajay Saxena took place on Dec 9, 2009 and the pleadings are yet to be completed. However, the Army has been using the September 13, 2007 interim order to stall all the legal proceedings in various cases of extrajudicial executions in Kashmir as was shown by Kataria case. Will fake encounters like the ones by Brig. Saxena and others be considered part of official duties that would require permission for prosecution of the accused? At present, there is no will on the government’s part to consider otherwise, and therefore, fake encounters have become an integral part of law enforcement and counter-insurgency operations. 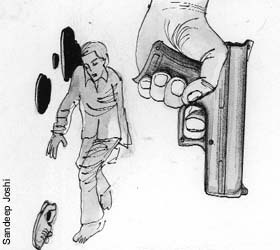 Promotions for killing alleged terrorists or wanted criminals have further increased fake encounter killings. The National Human Rights Commission recently stated that it alone registered 2956 cases in connection with police encounters in different parts of the country since its inception on October 12, 1993 till April 30, 2010. These figures do not include the fake encounters by the army in Jammu and Kashmir and the North East as the NHRC does not have jurisdiction over the army. Fake encounters are not only sustaining the insurgencies but also ensuring that the gains made by the governments against insurgencies in Kashmir and elsewhere are lost. India is yet to realise the costs of protecting criminals in uniform. Those who have visited Lisbon, capital of Portugal, must have seen the replica of the ship on which Vasco da Gama ventured in search of India. How hazardous their voyages must have been? The 21st century has demonstrated a different type of sea adventure. Solo voyages are undertaken round the world, spreading over months and sometimes a year. Imagine a sailor alone in a boat, caught in a tossing tempest? Adventure-shy Indians have been lately active participants in sea ventures. Forty-two-year-old Commander Dilip Donde of the Indian Navy became the first Indian to sale solo round the world. It all began on August 1, 2009 with INSV Mhadei, the first fibreglass yacht constructed entirely in India. He sailed through the Pacific Ocean, the Atlantic, the Arabian Sea and also crossed Equator, having made four halts during the voyage — Fremantle in Australia, Christchurch, New Zealand, Port Stanley, Falkland islands and Cape Town. Cdr Donde returned to Mumbai last month. He undertook over 21,000 nautical miles of voyage, spread over 276 days. He thus became the 175th solo circumnavigator in the world, the first Indian and the second Asian to have achieved this feat. The 56-foot-long Mhadei, with 23-tonne displacement, is made of wood core fibreglass with state-of-art navigation and communication equipment fitted on it. It was built by Ratnakar Dandekar of Aquartus Fibreglass in Goa. It is named after the eponymous river Mandovi, better known as river Mhadei in Karnataka from where it originates. Also, Sailors’ goddess in the area is called Mhadei. Donde, a National Defence Academy alumnus and a trained clearance diver in the Indian Navy, was trained by legendary Sir Robin Knox- Johnston, the first man to sail solo and non-stop round the world in 1968-69. As Donde was finishing the trip, he got a mail from Sir Robin, congratulating and welcoming him into the Solo Circumnavigator club as its 175th member. Donde says the voyage has been unforgettable as he tackled the high seas, battled giant waves and ferocious winds. He proposes to put down his experience in a book. Once the steering of his boat developed snag; it had to be rectified. Sometimes, the sea remained rough. “Several times, creatures in the sea have surprisingly looked at me. Many a time, the temperature in the sea refused to come down below 32 degree Celsius”, he has been quoted as saying. How did Donde beat isolation? 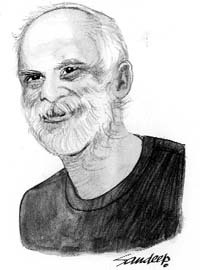 He says, “Mhadei was my constant companion. I would often end up talking to myself. My different roles on the boat, like chef or the skipper, were alter egos I spoke to. There was often other company like the Albatross that would fly along the boat or dolphins and flying fish that would frolic alongside”. Before embarking on the 21,000-mile voyage, Donde stored 600 litres water in the boat’s tank and took along a water maker — a reverse osmosis plant. He had also a gas stove on board and a pressure cooker which he used to cook food. He met solo sailors from Australia, the Falkland Islands and Cape Town. Some have gone round the world three times. At sea, he was a couple of miles away from 15-year-old Jessica Watson, the youngest solo sailor in the world. His colleagues and staff members call him a 24x7 VC, as he is accessible at any time. On the whole, the student community likes him the most. Prof. Punjabi, who is also a renowned expert on international relations and Kashmir conflict, speaks to The Tribune in Srinagar on various issues. Q: What are your major achievements so far as the Vice-Chancellor? A: One of the main achievements is the introduction of e-governance in KU, experts say what other universities across the country were unable to do. In KU, we have done it. Now we have e-governance in examinations, registrations, records have gone computerised. Earlier, students had to face a lot of harassment but now everything is available on the click of a button. We have a feedback form and I do monitor the grievance cell. The 40 colleges located in the rural areas have been connected with us. We also introduced course like M.Tech, M.Pharm, MPED, Food Science and Technology and Geo Informatics. Various new departments with many new courses have been opened in the university. Q: What are the areas you could not focus on? A: We lack infrastructure. I was pained to see that out of 35,000 students who applied for admission in various post-graduate courses this year, we were able to give admission to only 4,000 students. I have taken up the issue with higher authorities and we await upgradation of infrastructure so that maximum number of candidates could be adjusted. Q: You are credited for introducing distance education in the state after becoming the Vice Chancellor. What steps have you taken to disseminate distance education to far off areas? A: The scope of distance education has been expanded; we have introduced various new job-oriented courses. A new Directorate of Lifelong Learning has been launched. We are offering courses in remote places like Gurez, Ladakh and Kupwara. We have also increased the scope of courses like mobile repairs, electrical and plumber courses. Recently we held coaching classes for AIEEE for which we received 9,000 applications though we took only 300 candidates and 20 of our students qualified the entrance of AIEEE. We also hold coaching for IAS and KAS examinations. Q: If not an academician what would you have been? A: I would have been a lawyer, but my interest was always in academics. I also wanted to be an author but again as an academician I authored many books. Q: You are an expert in International relations and Kashmir conflict. How do you see the issue can be resolved? A: I would say it is a bilateral issue between India and Pakistan and the two countries should sit and decide it. The people of Kashmir look for good governance and development and we should create opportunities for them also. Q: How can we eradicate the menace of unemployment? A: We should harness traditional courses and introduce new ones. We should enhance the capabilities, we need to defocus and look for new and technological courses which are job-oriented. Q: How do you see female education in the state, especially at the university level? A: The trend of women’s education is increasing gradually and now we have equal ratio of both boys and girls. Even girls are now doing better than the boys here.